Home / Automotive / Forklift / Why the Counterbalance Forklift has Diminishing Value? Why the Counterbalance Forklift has Diminishing Value? This article might catch the eye of economists, but “diminishing value” here has a different meaning. If you are a confused economist wondering what a counterbalance forklift and diminishing value have to do with each other, you should know it isn’t what you think. As for the fleet manager and the forklift operator wondering how the counterbalance forklift, the trusty old classic, is losing its value, it is a bitter pill to swallow. The fact is, in the 21st century, in a time of sustainability and technology, the conventional counterbalance forklift is losing the war to stay relevant. It doesn’t mean that this type of forklift is unable to perform its intended function, but other models of forklifts now perform the same function better, faster and more safely as compared to it. The Moffett fork truck is an example of one such forklift that has left the conventional forklift in the dust due to its distinctive features and increased efficiency. In this article, we shall discuss how the conventional counterbalance forklift is offering less and less as compared to the ever expanding and progressive industry that is providing more benefits for the same amount of risk and investment to businesses that require material handling. Where the Counterbalance Forklift Lacks? Before we get to how the counterbalance forklift is providing less value, let us take a look at how it functions. The conventional forklift, as the name suggests, uses a counterbalance to balance the load. It has been around since the very start of the industry and has a simple construction. It has two forks to carry the load, a driver’s seat inside a cage that is supposed to protect the operator from falling material and a weight at the back that serves as a counterbalance to the weight of the load. The very design of the forklift itself exhibits a flaw, which we shall discuss further. The first and foremost problem with this type of forklift is that it offers less safety and protection to the operator. This is because of its questionable stability due to the counterbalance at the back. 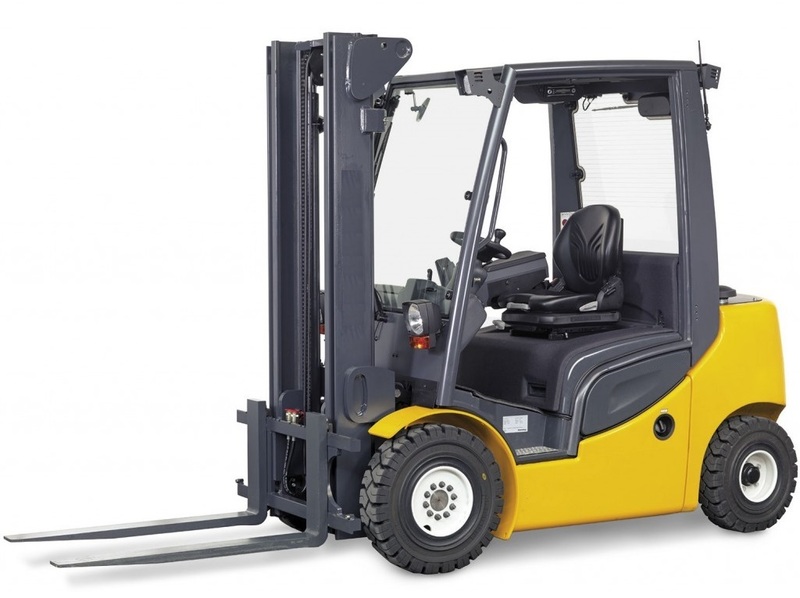 A forklift operates within the “Triangle of Stability” which is an imaginary triangle that exists between the front wheels and the center point between the back wheels. This triangle is where the center of gravity of the forklift lies and when a load is lifted, the collective center of gravity of both the load and the forklift shifts upwards. This is due to the collective weight of the load and the forklift. It helps to see the forklift as a teeter-totter with the front wheels acting as the point of pivot known as the fulcrum. When the load becomes heavier than the counterbalance at the back end, then the conventional forklift will tip over and the driver will have a serious chance of being injured. Therefore, a counterbalance forklift is at a greater threat to safety since a slight incline or faster-turning speed might cause the collective center of gravity to move outside of the triangle of stability and the forklift to tip over. Compare this with the Moffett truck-mounted forklift that has hydraulic stabilizers and therefore offers better stability, even with the load. This is not only a clear advantage for the Moffett forklifts, but a detrimental aspect for the counterbalance forklifts since safety is the number one priority for any material handling business. The counterbalance forklift lacks in efficiency in the sense that its competitors can carry more load, farther and in lesser time. This puts any business using the counterbalance forklift at an inherent disadvantage because they will take longer to fulfill orders. Once again, if we compare this with Moffett forklifts, that are able to maneuver better and offer better stability over rough terrains, it is easy to see why the counterbalance forklift has diminishing value. Even used Moffett forklift, purchased from authentic dealers like Moffett Truck, offer better efficiency as compared to conventional forklifts since they are built to last longer and are structurally, as well as technically superior. Sustainability is what contributes to the environment. For businesses and their products, incorporating sustainability has become a priority since we are moving towards a greener future. Diesel-powered conventional counterbalance forklifts are a threat to the environment since they do more harm than good. Manufacturers of Moffett equipment- Hiab always include sustainability into their annual review, as well as business practices. They provide leading material handling solutions to businesses all over the world and remain mindful of the environment as well. As such, the conventional forklift lags behind their rival in sustainability as well.